I've never actually seen the cover of this comic. I have in my collection a fair number of coverless comics that have found their way into the boxes over the years. I'm not picky about this sort of thing. Though the covers are wonderful works in and of themselves, I'm more particular about the story being complete, rather than the comic itself. I'm more inclined to not include a comic in my collection if the center pages have come loose, and there is thus story missing. This is the case with many of my Archie comics, and, sadly, one of my old Animal Man Strange Adventures issues. But today's story is intact, if coverless. Superman faces a foe that only he can see, which makes for some kind of hilarious panels of the big guy doing what looks like those instructional dance photographs that you might find in an old disco album. 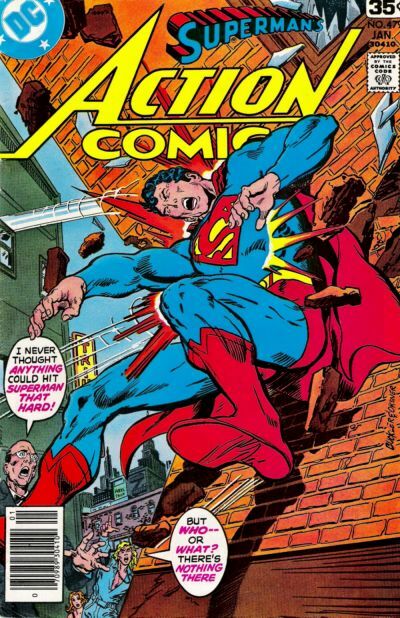 It's a competent story, and indicative of the Superman stories we see in this era, pre-Crisis, pre-gritwash. Writers appeared to just throw the most outlandishly powerful and weird villains at Superman to see what he would do. The random bad guys he faces in the 70s remind me of the weirdos the Doom Patrol fought a decade earlier. That's a strange lineage to trace, but I think that Superman is often far more weird that we give him credit for. Consider the wackiness of the 50s and 60s, much like that of Batman - I think in a lot of ways that surreality has never really left the Man of Steel. It's not just that he's equipped to deal with villains that are strong, but also those that are strange. The super human is not only physically superior, mentally superior, but also conceptually superior, able to intuit about alienness. Which Superman does very, very well.